What are you looking forward to most about parenthood, and what are you nervous about? 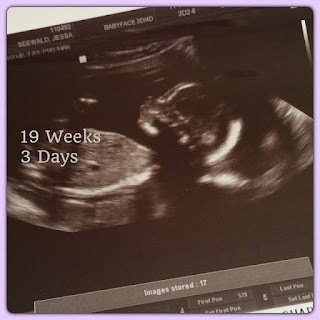 Jessa: Being that I am currently pregnant, I think I am most looking forward to holding this precious little one in my arms for the first time! Sometimes I just sit and wonder what our baby’s little face will look like. Will we see more pronounced “Seewald” or “Duggar” features? Will baby be born with Daddy’s blue eyes, or Mommy’s curly hair? It’s so amazing to think that God has entrusted us with this precious little life to love and care for. I think it is only natural for us to feel unprepared for such a huge responsibility, but we know that God will guide us each step of the way. Each night, we pray that God will prepare us to be good parents and that He will give us the grace to be able to raise this little one for His Glory. Ben and I feel especially blessed to have so many godly examples of other parents around us to look up to and learn from! We are constantly asking questions and learning from those who are further down the road in this journey of parenting. I'm sorry, but can't we hear about someone else sometimes instead of Jessa ALL the time?? Yeah and when Jill was engaged and married and pregnant people were saying the same a about her. How about just being grateful that we are hearing anything about any of them!! May God love you and trust you with his child you are about to receive. cute picture, love this family, may God bless your marriage and your expecting baby!!!! it certainly sounds like jessa has her head on straight! i'm sure she will be an awesome mother. Of course Jessa is looking forward to seeing her newborn, isn't very mom? Nothing new. So happy and excited for you both! You have everything it takes to be great parents! Every thing it takes..could u be more specific?? I know that the baby will be so cute! Thank you so much for keeping us posted. I miss you on TV so very much. I think of your family so often and prey for all of you. God bless you and Ben and so look forward to seeing a picture of your precious gift from God.